US canned vegetable and fruit producer, McCall, Farms has become the first to use a clear, plastic retort can for a line of slow-cooked vegetables, adding excitement to a stagnant category. Effingham, South Carolina-based McCall Farms, known for its line of high-quality, Southern-style seasoned vegetables and fruits, has introduced a new brand of ready-to-eat vegetables in a first-of-its-kind see-through plastic can. New Glory Farms Slow-Cooked vegetables in a clear can are now being sold in more than 400 Harris Teeter and Ingles Markets stores in the Southeast and mid-Atlantic states. “Our new See-Thru can is the most notable innovation in canned vegetables since canning was invented in 1833,” says Woody Swink, an executive at McCall Farms. The TruVue plastic can has been developed by Sonoco Products, also of South Carolina. “Glory Farms’ new clear can brings much needed excitement to the canned vegetables aisle of the store,” says Tom Outlaw of Ingles Markets. Presenting the TruView can at The Packaging Conference in 2016, Steve Gendreau of Sonoco described the retort can as a five-layer plastic substrate of polypropylene and ethylene vinyl alcohol that incorporates an easy-open steel lid and bottom closure. The technology involves a crimp seam plus an induction-seal end application. Labelling options include pressure-sensitive film or paper labels, and full-body wrap-around film labels. According to Sonoco, the TruView is the first clear can to withstand the rigours of continuous retort systems without overpressure, performing in high-temperature and high-pressure environments. 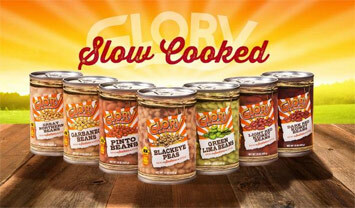 McCall Farms is using the can for seven varieties of Glory Farms Slow Cooked vegetables: Garbanzo Beans, Pinto Beans, Green Lima Beans, Light Red Kidney Beans, Dark Red Kidney Beans, Great Northern Beans, and Blackeye Peas.